From Tasmanian Devils, Cancer Cure? 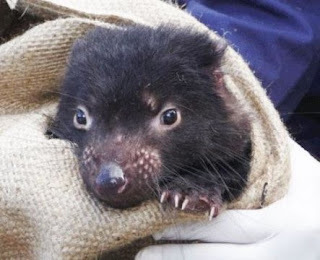 Scientists at Washington State University have discovered genes and genetic mutations that appear to shrink deadly cancer tumors in Tasmanian devils. This finding could have important implications for treating cancer in humans and other mammals. The WSU scientists say some of the genes that they believe trigger tumor regression in the devils are also in humans. This could lead to the development of drugs that shrink and potentially decimate tumors in humans. The devils are the largest carnivorous marsupial and found only in Tasmania. A deadly, facial tumor disease has pushed the devils to near extinction. 80% of the population is gone. An international team of scientists, led by WSU, found some of the animals are developing genetic resistance to the disease that shrinks the tumors and ends the cancer. Their findings have been published in the journal Genome Biology and Evolution.